Hey everyone, I hope you are well! I am here with a canvas I made as a thank you for being invited to a Billy Talent show on the guest list. There was a mess up with my order of their new album and to apologise they asked me to come along. They are one of my favourite bands so I was very happy! They have used swallows in their album art so I decided to create with that idea as my inspiration. I found a vintage image of a swallow and put it into Craft Artist 2 program where I reshaped and coloured them to my taste for this project. I then created the banner in the program too. I printed the images and banner out onto the same kind of card stock I used for the top layer of my canvas and carefully hand cut them all, including the banner. I then placed the banner on foam pads so the centre of the banner is lifted off the canvas and the ends of the pattern are glued directly onto the canvas to give dimension. Hey everyone, I hope you are well! :) I am here with a necklace I made using vintage images of swallows, printable shrink plastic, chain, jump rings and a lobster clasp. I started by creating the swallows in different colours in Craft Artist 2 software and making them a size I thought would work once shrunk to around half. I printed them off and carefully punched and cut around them. I tried to make the holes so the swallows would 'fit' once shrunk in a flying pattern. I then used my heat gun to shrink them all. After I had shut them in a book to make sure they flattened I got out the jump rings and attached them to each charm. Next was the tricky part trying to fit them together. Luckily they fit quite well and I just attached each jump ring to the next bird. Lastly I added the chain and catch. To varnish them to stop colour transfer once worn I painted them with a couple of coats of mod podge. 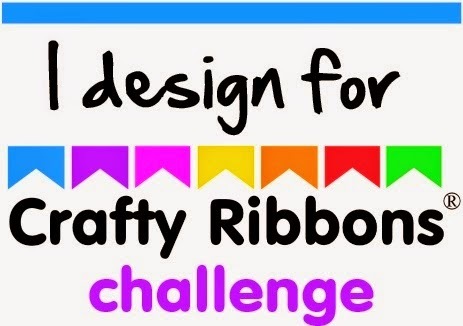 Hey everyone, hope you are well :) I am here with our 'Anything Goes' Challenge at Crafty Ribbons to show you a very quick and easy update to decor. I have some jute from making my silver jute corkboard a few weeks ago and it inspired me to try this way. I used a blank canvas, jute, cork sheets and Nautical ribbons from Crafty Ribbons. I started with the blank canvas. Over the canvas I placed a sheet of cork. I then padded the back of the canvas with cork too-finishing by backing the canvas with a thick cardboard sheet. Next I covered the canvas with jute, then added the ribbons to the edges for decoration. A very inexpensive and quick way to update your decor! Hey everyone, hope you are well! I am here with a CAS card I made recently using some small flower stamps, embossing powder, watercolour pencils and ink pads. First of all I embossed lots of flowers and leaves of various patterns and with clear or white embossing powder. Next I cut these all out by hand. I then coloured using Watercolour pencils and left to dry for a while. I then arranged the flowers and leaves onto a small card blank and affixed them when I was happy with how they looked. I then stamped the greeting in a gap I left. Lastly I embellished with coloured iridescent gems. Hey everyone, hope you are well! I am here with a make for Crafty Ribbons 'Halloween Colours' challenge. I really adore their selection of Viscose lace and this one is one of my all time favourite colours. Perfect for a glamorous goth halloween costume! I measured the lace around my neck then attached either ends to a ribbon clamp with some glue inside to ensure it is strongly held. I then added a clasp. I found the middle of the necklace and then used a jump ring to attach a butterfly cameo I made out of some butterfly paper, a blank cameo and glass glued with mod podge. Hey everyone, hope you are well! I am here with something I am very proud of. I found a second hand sideboard on ebay for a very good price and wanted to make it fit into my new room. I still had paint from painting my other furniture and I used some of my favourite papers I won in my placing of cardmaker of the year a few years ago from Stampin' Up cut using mosaic punch. We sanded the top of the unit down to allow the paint to adhere to the top. When there was enough for the paint to grab we used treatment to stop the knots on the unit that had previously shown through the old paint coming through again. (You can just about see the knots showing through in the first photo before we worked on it!) We also fitted the handles and filled the holes where the old knobs had sat. That way we knew where they would go after painting and wouldn't mess up the fresh paint. We took them back off then painted the unit. Hey everyone, I am here with some shoe bows to make my shoes look a little more glamorous and go with my new vintage dresses! I started by gluing four crushed velvet looking lilac ribbons with a fold in the middle of the back, then two of the lilac polka dot. I used a peg to make sure they dried securely. I then glued two of the back ribbons into a bow shape (not tying a knot keeps the bow from being too bulky!) and then added the polka dot in the centre with the other ribbons peeking out from behind it. I repeated this with the other side. I love these because you can wear them on any shoes, any time-and any where on the shoe! They don't damage your shoes so you can switch up basic shoes and make them really special and match your outfit! Hey everyone, I hope you are well! I am here with an advent calendar I made using Crafty Ribbons Christmas Advent ribbon, some beautiful snowflake felt, Crafty Ribbons Swiss Dots ribbon, plain white felt and my sewing machine for our Christmas challenge at Crafty Ribbons. I started by cutting white felt bigger than the ribbon in strips of six to a line to fit on the snowflake felt. I placed each strip on the felt and saw the kind of distance I wanted between them. I then began sewing each strip of felt and the advent ribbon onto the snowflake material. I used the slight line marked between each number as where to sew each section-making pockets on each. I then attached the swiss ribbon to hang it from. Hey everyone, hope you are well! I am with a CAS card I made using my favourite subject-butterflies! I used two lighter colours and a deep green memento ink pads and stamped the images on top of one another. I then added a sentiment underneath. Hey everyone, I hope you are well! I am here with a project to personalise a lovely slate heart I had in my stash. I used Stampin' Up stamps and white embossing powder to emboss an inspirational quote and butterfly decoration onto the heart to give as a gift. Its simple and effective but you must be careful because the slate gets very hot so you should leave it for a while to cool! Hey everyone, hope you are well! I am here with a CAS card using some new stamps and dies I found a little while ago which I love! I cut My Minds Eye papers with the dies and used both the negatives and the positive cuts on the card with different papers on each. I stamped the greeting then added half of the die cut at the end of the card pointing towards the greeting and added gems on the 'i' dots too. Thank for visiting and for all your lovely comments!